A previous post discussed the changes in how the red-crowned crane has been depicted in Chinese cloisonne. 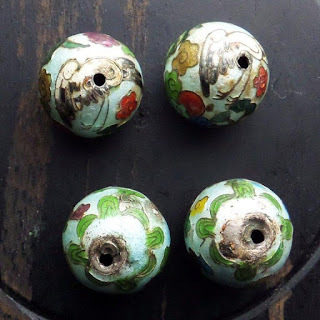 Oddly, the bead in the upper left features what looks like a tiny handmade screw or headpin patching a hole just above and to the left of the existing hole. 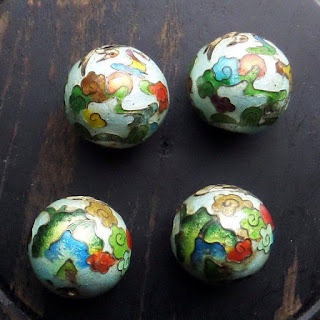 Glass enamels have to be formulated to adhere to specific metal substrates - glass that will stick to silver can't be used with copper, for example. The enamels in these beads seem to be the type that requires a silver base - whether silver plate works as well as solid silver, I don't know. 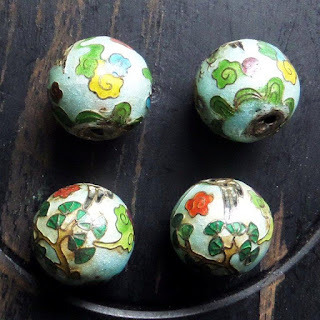 These mostly transparent enamels show up on the twisted wire cloisonne used in Chinese court necklace beads, as well as on small boxes, dishes, and servant bells that seem to date from the decades around 1900. The metallic white of a pure silver background allows the colors to shine clear and bright. 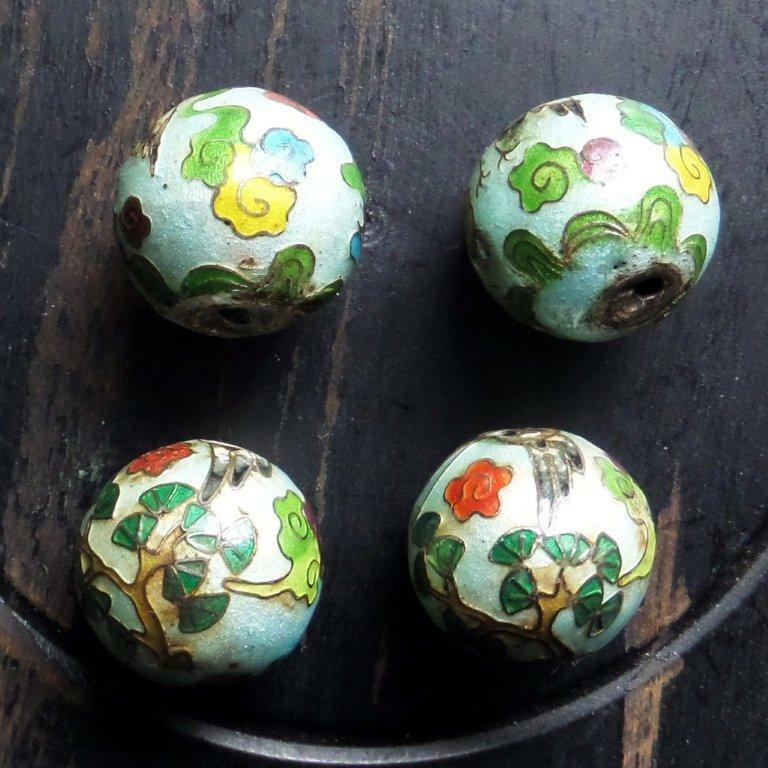 The pine tree, swirling clouds with red sun, green hill with grassy shoots and a pond, all match the iconography of the beads. Design is created by repuosse engraving on the reverse side. Dish is small, about 3" in diameter. 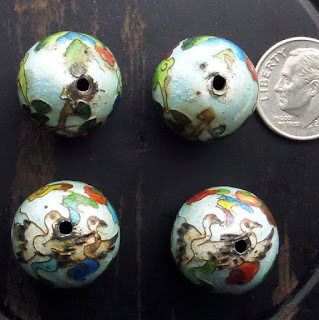 What I think makes these small dime-sized beads particularly rare is that design is rendered not with the more usual repousse technique or with twisted wires, but with tiny wires thinner than horsehair. My guess is that the wires were bent in pairs, hence the symmetry in the designs for each pair. 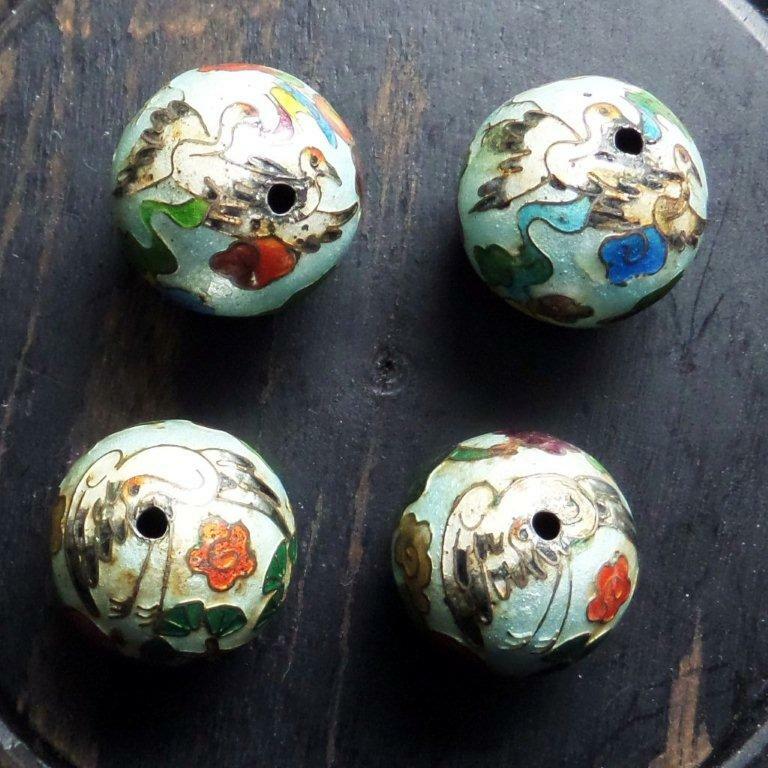 The positioning and size of the holes seems careless and awkward, which is too bad considering the level of skill it took to create the tiny cloisonne designs.